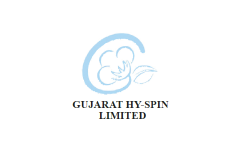 Business description - Gujarat Hy-Spin is engaged in manufacturing of cotton yarns. The company started with trading (including trading of products jobworked) of Cotton Bales, Cotton Seeds and Wash Oil and has now graduated to in manufacturing of cotton yarns mainly in domestic market and third party exports to some extent. The company’s promoters – Maganlal Parvadiya and Chandulal Parvadia – were cotton farmers and started activity of cotton ginning, pressing and oil in a partnership firm. With their knowledge in varieties of cotton, the promoters have helped the company to achieve a turnover of over Rs. 50 Crores. The company forayed into manufacturing of ring yarns in the year 2013. It sells cotton yarns to the traders who further sell it to other Industrial units for weaving and other purposes. It also sells directly to Industrial units for weaving purpose. Its manufacturing plant is spread 15381.28 square meters which is well equipped with plant and machinery such as Blow room, Humidification facility, Contamination sorter, Link Conner etc. The company also has test laboratory of Uster where the cotton yarns are tested. Gujarat Hy-Spin IPO allotment status is now available on Bigshare Services' website. Click on this link to get allotment status. 1] Easiest Way — Check with your bank and in their ASBA-Demat section of their eServices site, you should have an IPO option. Therein you can see the list of IPO’s they offer and reviewing each, you can usually apply with varying bid amounts, although your chances of getting allotted given the irrational IPO mania in our current bull market, you are best off applying at the maximum cutoff price. All you need to do is click on the firm you want to apply in, select the option “Download Online Application Form”; then in the form that opens, choose ASBA, Non-Repatriation and fill in the rest as appropriate. CRITICAL — Remember to submit only 1 application. Else you will get duplication and that can become a reason for rejection. Note — In Option 1, when you apply thro bank, your full amount of 1 Laksh chillar will get debited immediately. Via Option 2, the amount gets deducted from your account only when you get an allotment. Hope the above clarifies. God luck and God bless you with your investments. May you and your family be blessed with wealth for a happy life. I am a retail investor. How to invest in SME shares?